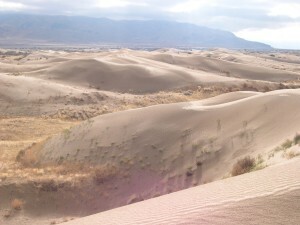 Sand dunes on the east side of Little Sahara Recreation Area. Gilson Mountains in background. 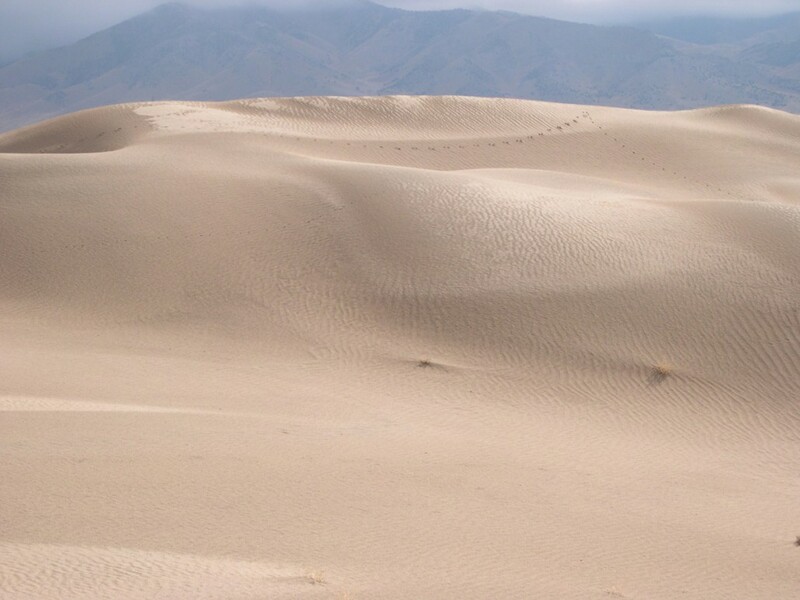 The Little Sahara sand dunes, located in the northeastern part of the Sevier Desert in western Utah, lie within the northern half of one of Utah’s largest dune fields (about 220 square miles). This dune field contains both actively forming or migrating dunes and plant-stabilized dunes. 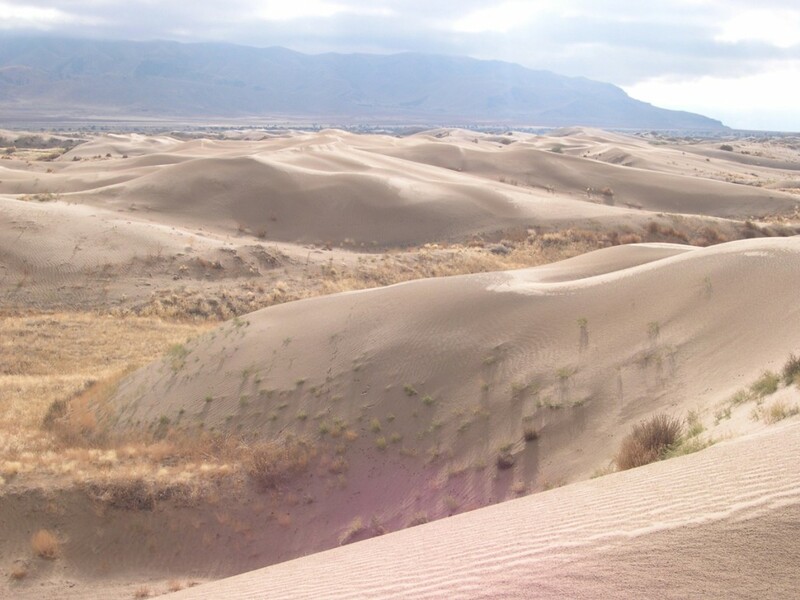 Administered by the Bureau of Land Management, Little Sahara Recreation Area is mostly devoted to off-road vehicle use. The Rockwell Natural Area, located in the northwest corner of Little Sahara, is a 14-square-mile section off limits to vehicles in order to preserve and shelter desert plants and animals. The Sevier Desert was inundated by waters of prehistoric Lake Bonneville from about 20,000 to 12,500 years ago. Lake Bonneville was a large freshwater lake that at its greatest extent covered most of Utah’s western valleys and small parts of Idaho and Nevada. Two distinct shorelines were created while the lake occupied this area, the Bonneville (highest) and the Provo shorelines. Each formed when the level of the lake remained relatively constant for hundreds of years. A large delta formed where the Sevier River, after leaving Leamington Canyon, entered Lake Bonneville while at the Provo level. This ancient delta extends from the area near the mouth of Leamington Canyon to just north of the town of Delta. After Lake Bonneville receded, winds dominantly from the southwest began to transport some of the exposed deltaic sand northeasterly, eventually creating the current dune field. Most of this dune field is still active, with dunes migrating between 5 to 9 feet per year. Generally, the quantity of windblown sand in the dune field increases as you move farther northeast. A gradual rise in elevation to the northeast and bedrock barriers within the dune field cause the moving sand to slow or stall and accumulate. The most prominent barrier is the Sand Hills (also known as Sand Mountain) located within the recreation area. The Sand Hills lie directly in the path of migrating dunes and are aligned at right angles to the prevailing wind direction. Sand travels around the ends of the hills or through passes to form dunes on the other side. Although the sand consists mostly of quartz grains, minor amounts of felspar, biotite, calcite, garnet, magnetite, and other minerals are also present. Try dragging a magnet through the fine-grained sand to see how “hairy” it becomes when the magnetite particles cling to it. The magnetite probably eroded from volcanic rocks along the path of the Sevier River. The Little Sahara Recreation Area is about 110 miles from Salt Lake City via Nephi. Travel on I-15 to Nephi. Take exit 225 and travel west 14.5 miles on State Route 132 to Juab County Route 1812 (“Sand Dunes” sign). Turn right (northwest) onto Route 1812, travel about 14 miles, passing through Jericho Junction (intersection with U.S. Highway 6), until you reach the turnoff sign for Little Sahara Recreation Area. Turn left (southwest) to enter the area. There is a daily use fee. Glad You Asked: Have meteorites or meteorite craters been found in Utah?